Over the last decade, streaming as a medium has seen tremendous growth. Services like Netflix, Hulu, and Amazon Video are no longer just post-hoc distributors of broadcast television content, they have become content creators and are producing some of the most well received "television" content of the past few years. For example, at the 2013 Primetime Emmy Awards, not a single major Emmy nomination was received by a streaming service; three years later, in 2016, Netflix alone was nominated for 17 awards-more than any of the major broadcast networks. With a deluge of quality online-only content being produced, and a move to get more content from the traditional broadcasters online, it's no surprise that there has been a move toward ending cable television subscriptions or "cord-cutting" during the same period. According to a Pew Research study, in 2015, one-in-seven Americans had canceled their cable subscriptions, and 35% of adults aged 18 to 29 were either cord-cutters or "cord-nevers", a group who had never had a subscription to begin with. Further, increased internet availability, increasing connection speeds, live camera based content and the ability of various devices to view streaming content almost anywhere, at any time, with the highest possible quality, at the viewer's individual location has been driving growth. However, while the group that relies on cable and broadcasters is shrinking, traditional television is still king. Offering visually high-quality images over existing infrastructures, dependable distribution of live content, and features that aide in accessibility for a broad swath of the population, for an "out-dated medium", television has some major advantages. To even be considered a comparable service and a public good, online streaming needs to look to traditional broadcasters for examples of how to enhance their services and advance the technical aspects of streaming video in the same way that they did content. As cliched as it may sound, television brought a window-to-the-world into the home. Allowing the viewer to watch the day's news each evening, catch their favorite team, or follow live events as they happened, nothing offers the same real-time information distribution as broadcast television. Live content online is new. Platforms like Facebook Live and YouTube are facilitating it, and there have been a few events (Trump Inauguration, 2016 Olympics) that have had major live streams available, but these are intermittent and based around one-off events. Through these same "live streaming" platforms and the ubiquity of smart devices, we can view stream live feeds from anywhere. As noted, this is a place where traditional broadcast has stood out. Being able to offer those once-in-a-lifetime events to viewers with sharp picture without major latency issues, technical restrictions, or loss of quality is key to engaging viewers. Online, the difficulty of offering the same experience when working with high quality live streams can boil down to one issue; bandwidth restrictions. It's fine if you can offer a dedicated connection, but once you need to stream across Wi-Fi or to a wireless device, bandwidth demands and connectivity raises major issues. To combat this, advanced compression algorithms have been developed and are being perfected. Take H.264 for example; available since 2003, H.264 is the de facto gold standard compression technology in the world not only because it's widely available for users but because it's been constantly tweaked and optimized allowing better and better pictures to be squeezed into a smaller pipe. In many cases, the compression is virtually imperceptible, and by choosing to integrate an optimised codec like H.264, it'll be easier to get both live and recorded content to more people on the connections they currently have. At the end of the day, the decision on what will be watched comes down to how easy it is for people to tune in and take in an experience that allows them full enjoyment. The general user experience in both on and offline mediums is fairly comparable, with interactive guides allowing users to preview what they're going to watch, along with many added features bringing out program/stream details. However, for those with accessibility concerns, the world of online streaming is still the Wild West. With few rules and standards governing how online video is to be displayed, these people face a huge disadvantage in comparison to the FCC governed and experienced world of broadcast. For example, closed captioning has been essential in ensuring that all deaf viewers have the opportunity to get a fulfilling television experience. This has been mandatory in the United States for almost 25 years and makes it easy for not just the deaf, but those with lesser hearing impairment, to have access to programming. However, technological limitations have prevented closed-captioning signals from even being embedded into a stream that comes from a caption-enabled broadcast signal. Captioning for live streaming has been almost non-existent and only available in video-on-demand situations where transcription has been completed beforehand. By taking the lessons of broadcasting, and including some technological twists, it's not a difficult process to offer a stronger, more familiar viewing experience for those who are moving to a primarily on-line viewing lifestyle. 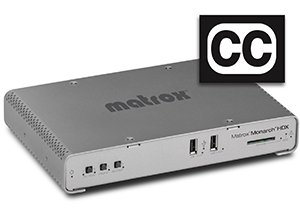 For example, as mentioned above, closed captioning data (even live) is already embedded in the original analogue broadcast signal, and Matrox has integrated a method for extracting this signal into the Matrox Monarch HDX streaming/recording encoder. Retrieving the captioning data from the SDI VANC or line 21, the Monarch HDX device then embeds the data within the H.264 essence as CEA-608. This caption-enhanced content can be streamed (RTMP) to media servers such as Wowza, or content delivery networks (CDNs) including YouTube® Live or Ustream®, or recorded as MOV/MP4 files, and then be decoded by players such as Telestream® Switch. This means that not only can captioning be taken from an offline workflow, but it can be done live and easily provided to the online viewer. Streaming is still developing and coming into its own. It remains to be decided if we all end up cutting the cord, if broadcast and internet converge, or if cable remains in our homes over the long term. By making the streaming experience exceptional, traditional television will be forced to compete and, in the end, viewers end up the winner, with an ever rising bar for video content, both on and offline.